We know that God is light and there is no darkness in Him. Light by its very nature will always offend the darkness. So whatever issue you may find yourself discussing or illuminating, if you are being the light of God in this world by speaking the truth born of God’s love and His Word, you are sure to offend those who love the darkness and wish to remain there. However, as Christ followers, I believe we must guard our hearts to make sure we do not find ourselves rejoicing because we are offending. Hans Fiene, in his recent Federalist article titled, Google Firing Over Diversity Memo Shows How Outrage Addiction Is Making Us Stupid, wisely observes and articulates how outrage has become an addiction and has suppressed the critical thinking of many as a result. He also points out how we can all fall in to that trap regardless of our political leanings. I would dare to say that I believe the other side of that same coin is that we can become addicted to the thrill of being offensive, suppressing our willingness to actively listen to understand where a person is and extend a hand up. While sarcasm and satire can sometimes be very effective at illustrating a point, habitual use of satirical and snarky comments and comebacks are the fallback position of someone who may have become either too proud, too lazy, or perhaps emotionally indifferent and apathetic to their hearers, so that they are no longer willing to respond thoughtfully (with grace) and intelligently. We have not been commissioned to offend for the sake of offending, rather as foreigners and exiles in this world (but no longer of this world), we are to “seek the welfare of our city”. Our goal is to be a light that shines the light of God’s truth born of His love, in the hope of redemption. If you only see yourself as a hammer, then soon everyone becomes a nail. May all who love and obey God continue speaking the truth in love as we ought to, doing so boldly and courageously. 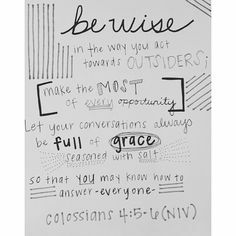 But let our conversation be “full of grace and seasoned with salt”. We must always bear in mind what is written, that our battle is not against flesh and blood (people), and the weapons we fight with are not the weapons of the world, as we demolish ungodly arguments.